Getting the Dualshock 4's triggers working in analog. Getting the DS4's triggers working as analog instead of digital in Dolphin is a bit of a pain, so I thought I'd make a quick post on getting it done. Unlike the 360 pad's triggers, when you assign the DS4's in dolphin it immediately recognizes them as buttons (6 and 7, if I recall correctly. ), which is not what we want because it makes firing while moving impossible in Sunshine, not sure of any other games that actually use the GC controller's analog triggers. In addition to this, with the 360 pad you could get analog working by simply clicking the L/R-Analog button and pressing the trigger - Not so with the Dualshock 4. 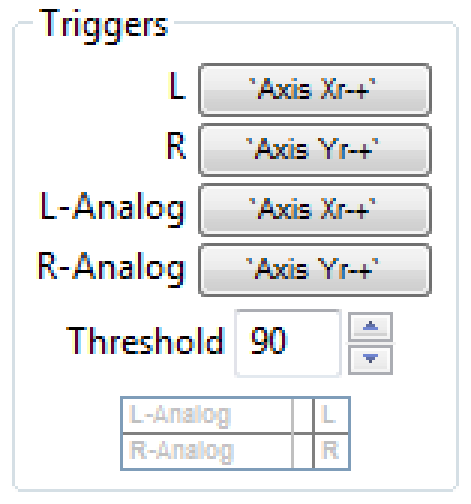 In order to get the DS4's triggers working you must bind both the button and the analog to the trigger's analog axis, which is "Xr-+" for the left, and "Yr-+" for the right. I'll put a picture here showing what I mean. Other than that, it's a great controller. Can you use the ps, share, and options buttons when using a ds4 on pc? For example, to map them to something in dolphin? (11-03-2013, 12:33 AM)RachelB Wrote: Can you use the ps, share, and options buttons when using a ds4 on pc? For example, to map them to something in dolphin? The Options and Share buttons are mappable. The touchpad can also be clicked to be used as an extra button. I don't think the PS button is mappable but I'm not sure. Awesome. Could i bother you to check the ps button? (11-03-2013, 01:37 AM)RachelB Wrote: Awesome. Could i bother you to check the ps button? Just checked and it turns out it is mappable. Yeah, lol. If you haven't already noticed, I'm kind of obsessed with controllers. Excellent, thanks for checking. I might just have to buy one. It seems really nice.